“Kwajalein Chaos: All Enemies Foreign and Domestic” from Christian Faith Publishing author Scott Cottrell is an interesting novel about Colonel Seth Grayson and a few senior officers at the Pentagon as their adherence to the constitution is tested while they defend it despite conflicting orders from their commander-in-chief. Published by Christian Faith Publishing, Scott Cottrell’s new book is a historically linked work of fiction, inspired by the events that transpired in the Marshall Islands in the central Pacific, the US Army operations there during the World War II, and current-day issues about war and politics. To further appreciate this engrossing book, a character list with indications of historical figures and endnotes are provided by the author to show readers his references in finishing the story that stresses the importance of holding on to their faith. View a synopsis of “Kwajalein Chaos: All Enemies Foreign and Domestic” on YouTube. Consumers can purchase “Kwajalein Chaos: All Enemies Foreign and Domestic” at traditional brick & mortar bookstores, or online at Amazon.com, Apple iTunes store, Kobo or Barnes and Noble. 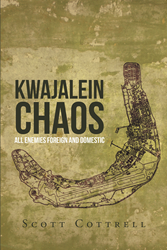 For additional information or inquiries about “Kwajalein Chaos: All Enemies Foreign and Domestic”, contact the Christian Faith Publishing media department at 866-554-0919.